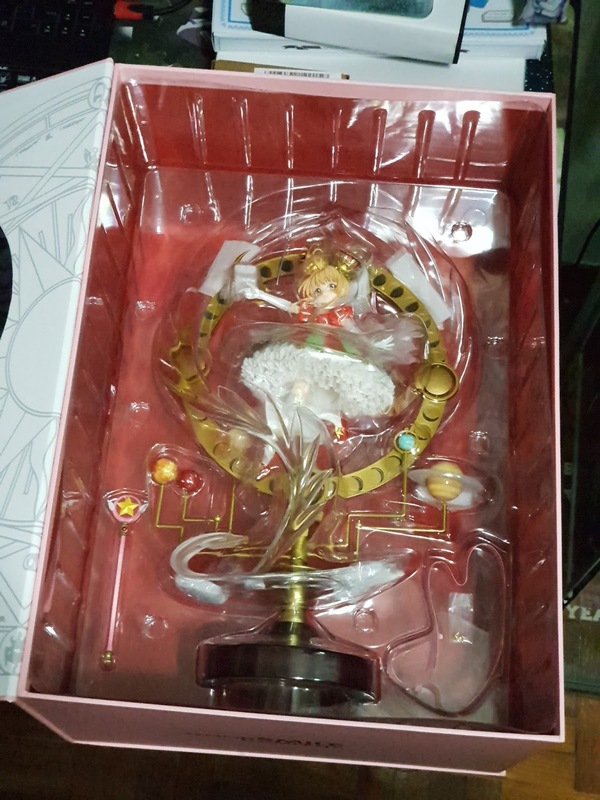 One of the best figures released this year is Cardcaptor Sakura with her ridiculous amount for shipping, which totals to about 10k yen. While I wouldn't consider getting her off the aftermarket due to the high shipping price, getting her off pre-order on Good Smile Company at 25k yen with free shipping was definitely a steal. 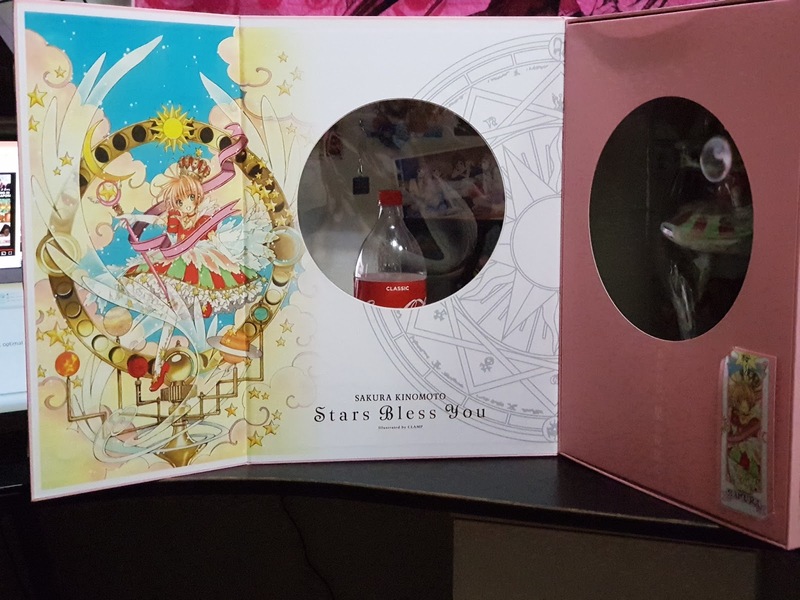 Other than her box being absolutely huge (as you can see from the images below), the inner panels of the box showcases the pretty illustration. Her name and set version is printed in a beautiful shade of grey which keeps it elegant and calming to look at. 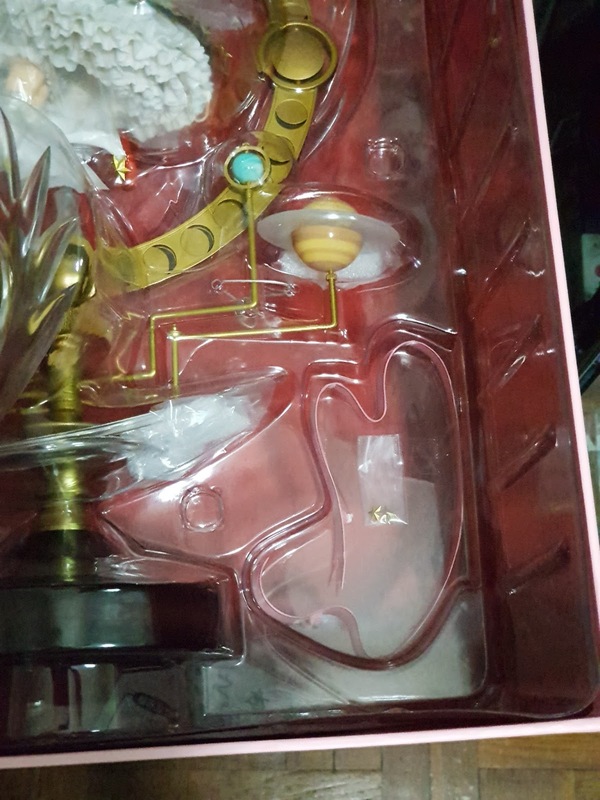 Her name and set is printed all around on the outside of the box as well, gold on the pink box. The window is really small on the side of the figure and doesn't showcase much of her base at all. 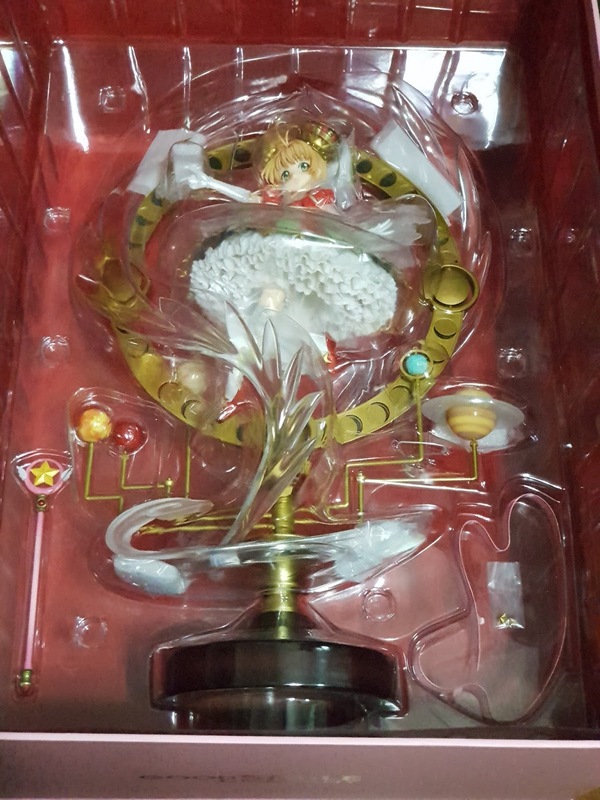 Due to the thickness of the cardboard box, the inside of the box is really dark and you can't exactly view her beauty if you keep her all shut up in the box. I would have appreciated a full window when you open the box instead, however, there is a book-mark sized illustration there which would be difficult to insert anywhere else... so perhaps my idea isn't too feasible. Here's a zoom-in of the illustration if you are interested. Removing the sheet with the circle window reveals the figure in her full glory. You can see her right in front of her base as if she is already assembled, but trust me... it is really quite a pain to put together... if you don't have time to do it on the day itself. 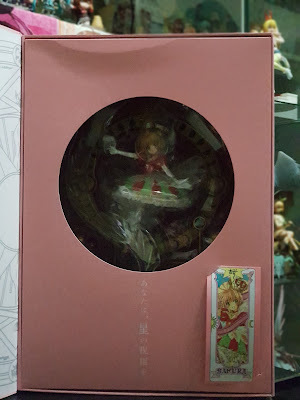 I will write another article regarding the assembly, but for now, let's look more on the packaging here. A close-in shows how much plastic and foam is included in this figure. This is understandable, since she comes with so many delicate features and bright colors. There are quite a few removable parts as well so those would need to be protected well too. Right above her outstretched right arm, you will see this metal piece. 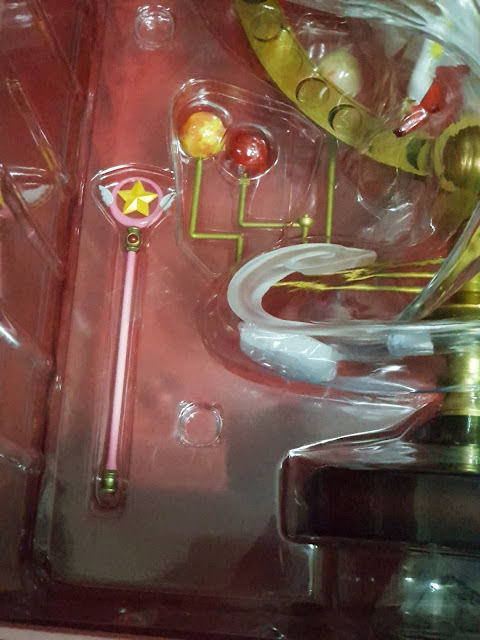 There are 2 of such pieces on the blister and it is meant to hold the two pieces together so it doesn't come apart during shipping. They are a pain to take out and may need a little puzzle solving on your end, but hey, anything to keep Sakura safe, right? I'm sure GSC doesn't want to have to replace her due to any damages incurred during shipping as well! Some of the accessories she comes with include her wand and of course the planets on her base. The whole base is practically intact already, however, some parts have to be removed for a moment in order to fit Sakura on it. This will be covered in the "Assembly" post later. The other side also features two more planets which are already attached to the base. 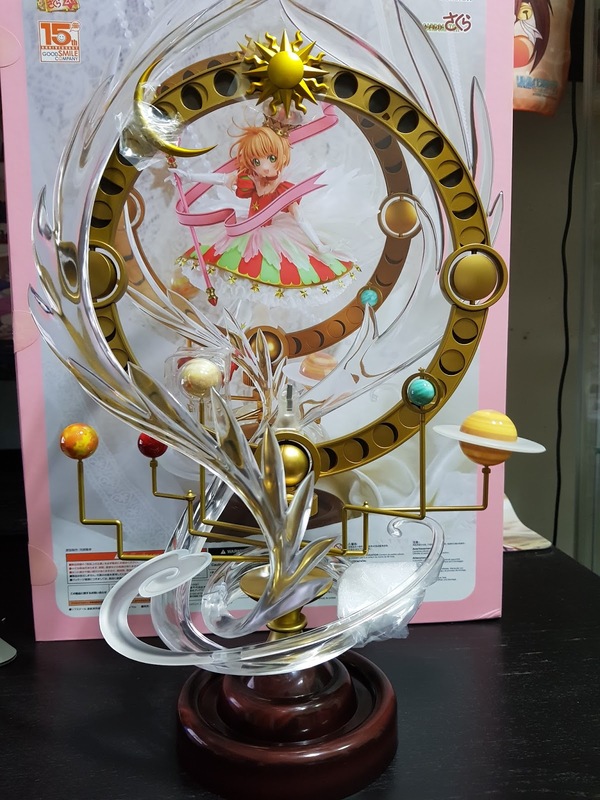 The rods holding the planets can be moved, which means you can arrange the planets to suit your display. 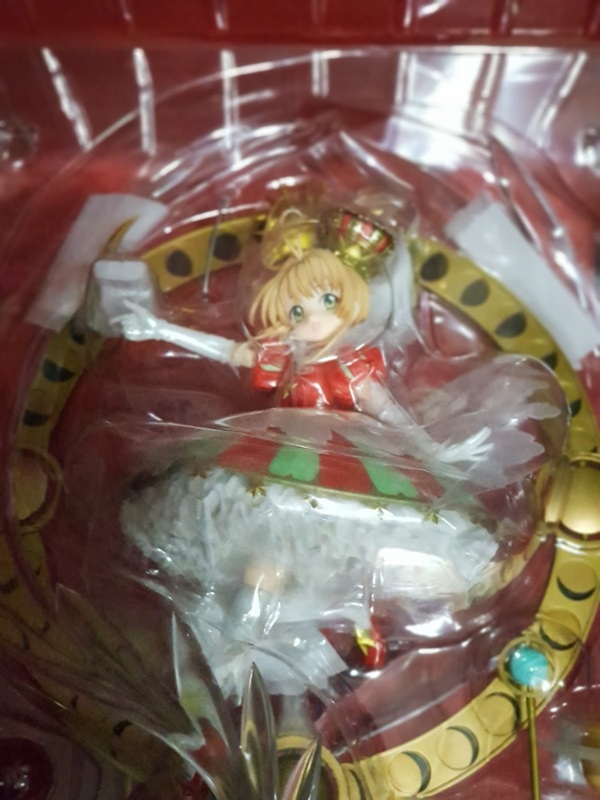 She also comes with some replacement parts -- tiny gold stars, which are used at the hem of her dress. Each star here is individually attached to the hem. There is a thin extension at one apex per star and that is used to insert into the hole of the dress. 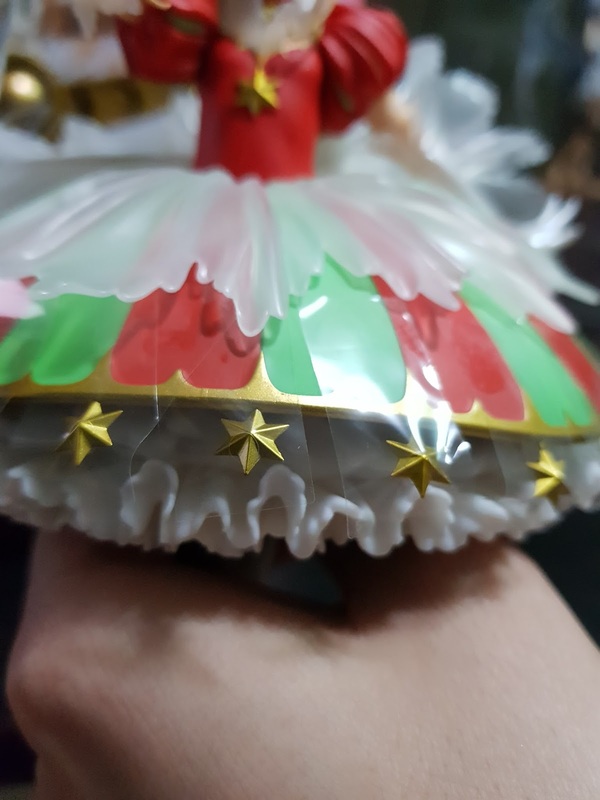 In addition to the extras which GSC provided, we see that there is actually a plastic sheet covering each individual star. If you had no idea how fragile these are... you'll know after looking at this! From a lower angle, we see that she is so detailed, right down to the numerous layers under her skirt. While her base is mainly gold and brown (which sets the feel of elegance), Sakura is mainly red herself. 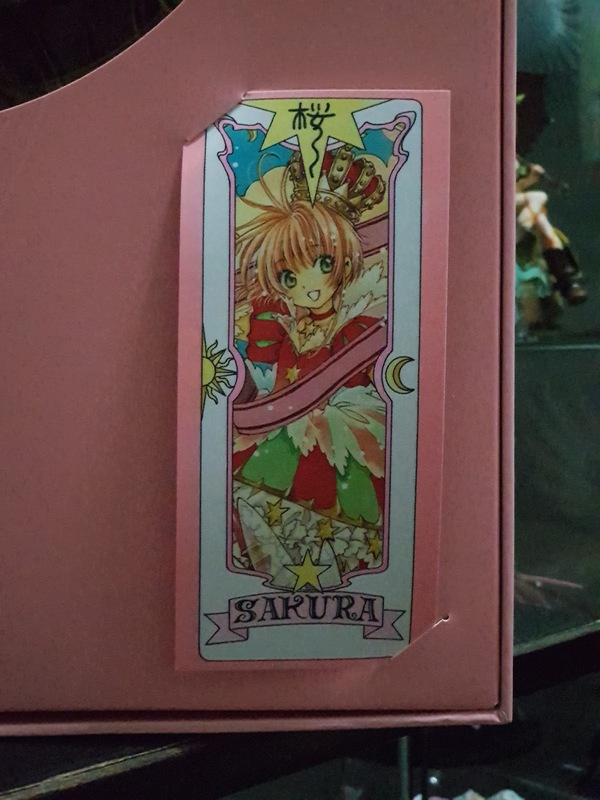 I find that red is a color that suits Sakura perfectly and this figure has managed to bring out her fun, cheerful and innocent sides all in one figure! 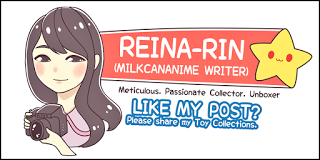 I will be looking at the base, assembly, and figure in the following articles so do stay tuned if you love this figure as much as I do! No Comment to " Figure Unboxing and Review: Cardcaptor Sakura (Good Smile Company) Thoughts on Packaging "